Buzzing vernissage, strong attendance from collectors and art professionals, and significant sales—Art Brussels confirms its position as one of Europe’s foremost contemporary art fairs. 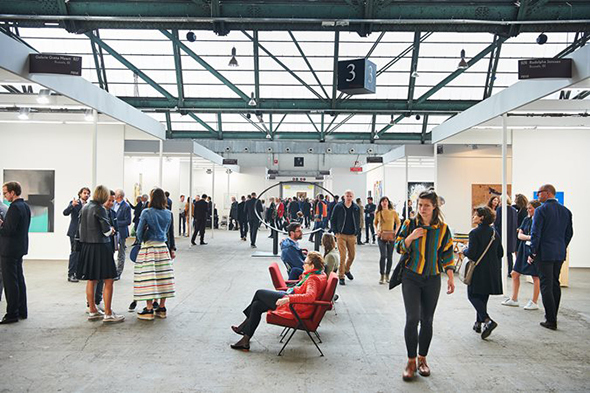 The 34th edition of Art Brussels, set in the new location of Tour & Taxis, took place from April 22 through 24 (Vernissage April 21) with 141 international galleries exhibiting. Amongst the PRIME galleries Jablonka Maruani Mercier (Brussels) sold more than 10 works on the first day for between 75,000–100,000 USD, including Hank Willis Thomas’ speech bubble sculpture Ernest and Ruth, on view as part of the OUT OF THE BOOTH sculpture route. Other notable sales on the opening day included a large bronze by Jaume Plensa at Galerie Lelong (Paris, New York) for 340,000 EUR. Brussels-based gallery Meessen De Clercq also reported in excess of 30 sales with works priced between 2,000–60,000 EUR. Steve Turner (Los Angeles) reported strong sales for both of the two artists presented in the stand, Camilo Restrepo and Yung Jake. PRIME gallery Galerie Greta Meert (Brussels) sold a number of works by Edith Dekyndt, who had a solo show at WIELS during Art Brussels; and two paintings by Koen van den Broek for 50,000 EUR each. Among Galerie Rodolphe Janssen‘s (Brussels) noteworthy sales, was a work by Sam Moyer for 35,000 USD to an important private collection in Brussels. Waddington Custot Galleries (London) highlighted sales of works by Frank Stella, Bernar Venet and French artist Fabienne Verdier. Newcomer Lyles & King (New York), established less than a year ago, made their European art fair debut at Art Brussels and sold nine paintings by Chris Hood and two major sculptures by Phillip Birch, together ranging 6,000–16,000 EUR. New Art Centre (Salisbury) sold very well, among other pieces, a work by William Turnbull to an Australian collector for around 200,000 EUR. Galerie Ron Mandos‘s (Amsterdam) SOLO booth installation by upcoming Dutch artist Levi van Veluw sold for 45,000 EUR. Following the fair, D+T Project‘s (Brussels) popular OUT OF THE BOOTH large-scale sculpture My light is your light by Krištof Kintera will be exhibited at both a private museum and an institution. Strong sales of younger artists confirmed Art Brussels’ profile as a foremost discovery fair. General Store (Picton, Australia) commented on the benefits of art fair exposure for their artists, after receiving interest from other dealers at the fair to represent exhibiting artist Pete Wheeler. In the DISCOVERY section, the collaboration between Copperfield (London) and Division of Labour (Worcester) sold out and brought about promising placements for their emerging artists, in particular the sale of two works by Alastair Mackie to the Eres Foundation in Munich. In the REDISCOVERY section, where galleries profiled previously overlooked or underappreciated artists with work made between 1917–87, Timothy Taylor (London) sold two works by Eduardo Terrazas at 36,000 USD a piece. Photographs by Barbara and Michael Leisgen sold well to international collectors at beta pictoris gallery (Birmingham, AL. ), including the artists’ 1972 work Eintauchen to a New York collector for 18,000 EUR. Also in this section, Galerie Steinek (Vienna) had success with the work of Renate Bertlmann, selling works to a European museum and many private collections for prices between 2,000 EUR and 34,000 EUR, as well as receiving interest from international curators. Influential art world figures such as Hans Ulrich Obrist (Serpentine Gallery), Iwona Blazwick (Whitechapel Art Gallery), Konrad Bitterli (Kunstmuseum St. Gallen), Charles Esche (Van Abbemuseum), Dirk Snauwaert (WIELS), and Marina Dacci (Collezione Maramotti) were in attendance, among others. 16 museum and other institutional groups, including the friends of Palais de Tokyo and Centre Pompidou, S.M.A.K, Stedelijk Museum, SAHA Council, and Tate Modern, toured the fair embracing the opportunity to view the museum-quality show Cabinet d’Amis: The Accidental Collection of Jan Hoet (sponsored by Anglo Belge Special Risks and Stibbe), curated by Artistic Director Katerina Gregos. The exhibition was complemented by an extensive talks programme, co-organised by Art Brussels and CAHF (Contemporary Arts Heritage Flanders). Art Brussels will take place on April 21–23, 2017.